By Daniel Horowitz--On Tuesday, September 25th, as we prepared for Yom Kippur, a bright light in the life of Jewish Toronto was forever eclipsed. As we readied to make our way to synagogue, word came that Chaim Neuberger had passed away at his home. The courageous, visionary and generous community leader’s gift to UJA Federation’s Tomorrow Campaign made possible the creation of a new state-of-the-art Holocaust Education Centre for UJA Federation’s Sherman Campus, located on Bathurst Street, just north of Sheppard Avenue. “Educating people of all faiths about the Holocaust is so important to me; after all, I’m a part of the Holocaust,” said Chaim, whose entire family – his parents, four brothers and one sister, were all killed by the Nazis. Chaim only managed to escape the same fate due to the heroic selflessness of a non-Jewish Polish family who took him in - along with nine other Jews - and hid them for nine months in a tiny bunker - only 3 meters by one meter - closets and even a horse stable, where Chaim would often sleep under piles of straw and hay. For years after the war ended, Chaim expressed his gratitude by regularly sending money to the family that saved his life. After the war, he decided to leave Poland, travelling to Austria and Italy before ultimately making Canada his home. It was thanks to a special initiative by the Canadian government that sponsored Jewish orphans that Chaim came to this country in 1948. After docking in Halifax, he went to Montreal before ultimately deciding to give Toronto a try. His instincts proved correct as, within just a few short years, he began to find success in the city’s booming building business. He also found personal success, with his wife of 46 years, Sarah. The couple had two daughters – Edie and Myra – and eight grandchildren. Sarah passed away ten years ago. The Neuberger gift will ensure that the voices and legacies of Chaim, Sarah and other Canadian survivors will be preserved and transmitted to future generations through multi-media, exhibits and public programs. 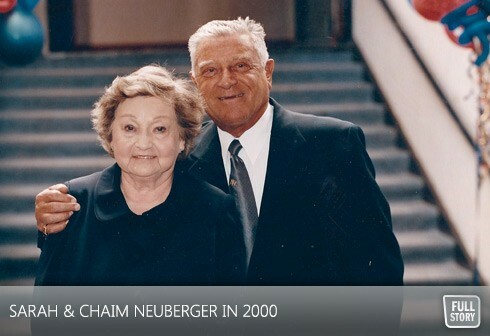 Honey Sherman, the Chair of the Sarah and Chaim Neuberger Holocaust Education Centre, praised the Neuberger family for their commitment to education. The Centre’s Executive Director, Mira Goldfarb, who took on the role shortly after the Neuberger gift for the new facility was made, reflected on the importance of this investment in the future of Holocaust education. “It is a true privilege to work with our leadership in making the Neuberger vision a reality,” said Goldfarb. Chaim’s funeral was held on Thursday, September 27th at Beth Tzedec Congregation.